Blog Beer Powered Cars, Ethanol Fuel from Beer Waste - I'll Drink to That! Beer Powered Cars, Ethanol Fuel from Beer Waste – I’ll Drink to That! 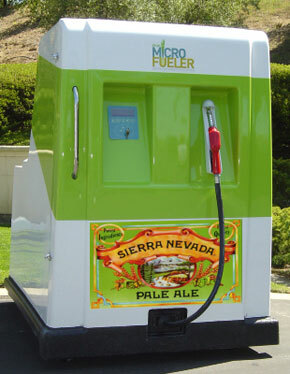 Sierra Nevada Brewery did something pretty green and innovative recently- they are converting their waste products into fuel for their automotive fleets. They are using the EFuel100 MicroFueler home ethanol maker along with the bottom of the barrel brewery waste of yeast and sugar to create Ethanol (E85) fuel. It’s starting out as a pilot program for just their own fleet, but they hope to expand it to include employees, distributors, and may go even further with it through E-Fuel’s distribution network. These refrigerator-sized portable ethanol refineries raise the alcohol content in the mix to 15 percent and remove the water. With 1.6 million gallons of waste created each year (currently sold to farmers as feed), there is quite a bit of potential fuel. Creative waste solutions and environmental awareness are starting to gain traction among many micro-brewery’s, appealing to many of their ‘green minded’ customers. I love to see brewerys go green! Wooo! I love this site. Oh, to be cool and green! Using the by-products of Sierra Nevada brewing to power their own vehicles. How incredible is that? I was told recently that they (the ubiquitous) are working on landfill gases to produce electricity. With enough ingenuity we can use up all of our waste. Wouldn’t that be great?? ?